As a knowledge of the alphabet and its permutations and combinations is to traditional literacy, and as a knowledge of numbers and their permutations and combinations is to mathematics, so a knowledge of the biological and conceptual alphabets of the brain and its apparently infinite permutations and combinations is to Mental Literacy. The Mind Map Book3 with its emphasis on the radiant biological and conceptual architecture of the brain, is an introduction to Mental Literacy, a concept which we hope will have profoundly positive effects on the individual, the family, the organisation, societies, and civilisation in general. In our historically 'mentally illiterate state', the mind of the individual is imprisoned in a relatively small conceptual framework, without the use of even the most primary Mental Literacy tools with which to help expand this conceptual framework. Even traditionally 'well-educated' and literate individuals are significantly restricted by the fact that they are able to use a fraction of the biological and conceptual thinking tools which are available. The Mentally Literate human is capable of turning on the radiant synergetic thinking engines, and creating conceptual frameworks and new paradigms of limitless possibility. 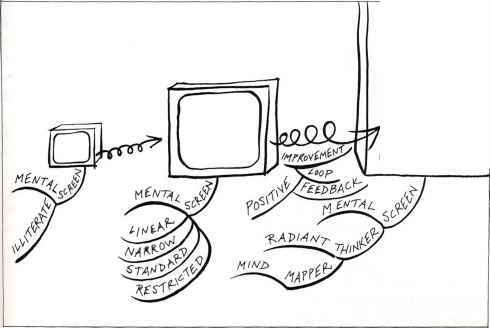 The illustration above shows the 'mental screens' of the illiterate, the linear, and the Radiant Thinking mind. It can be seen that this last screen, by the nature of the intellectual machinery which drives it, continues to grow with an infinite possibility for size and dimension. It is the Radiant Thinker's automatic self-enhancing feedback loop which allows this massive intellectual freedom, and which reflects the inherent ability of each individual's brain - a formidable powerhouse, compact, efficient and beautiful, with potentially limitless horizons. Applying Radiant Thinking principles to the brain enables you to range more freely among the major intellectual activities of making choices, remembering and creative thinking. Knowing the architecture of your thinking allows you to make choices and decisions using not only your conscious mental processes, but also your paraconscious - those vast continents, planets, galaxies and mental universes waiting to be explored by those who are Mentally Literate. The Mentally Literate individual is also able to see the vital powerhouses of memory and creative thinking for what they really are: virtually identical mental processes that simply occupy different places in time. Memory is the re-creation in the present, of the past. Creativity is the projection, from the present, into the future, of a similar mental construct. The conscious development of memory or creativity through the use of Mind Maps automatically increases the strength of both. The most effective way for the individual to develop Mental Literacy skills, and to amplify the cognitive screen, is to follow the Radiant Thinking guidelines outlined in Chapter 10. The guidelines are a training ground for the development of mental skills such as those used by the 'Great Brains' (see Chapter 2 and pages 295-304). Indeed Leonardo da Vinci, arguably the greatest all-round user of mental abilities, devised a four-part formula for the development of a well-rounded brain that reflects these guidelines perfectly. 1 Study the science of art. 2 Study the art of science. 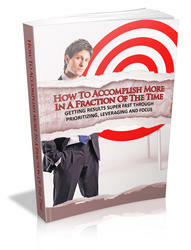 3 Develop your senses - especially learn how to see. 4 Realise that everything connects to everything else. 'If this property of complexity could somehow be transformed into visible brightness so that it would stand forth more clearly to our senses, the biological world would become a walking field of light compared to the physical world. 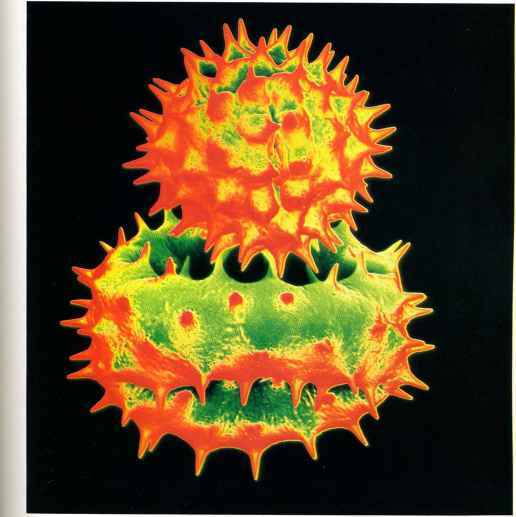 The sun with its great eruptions would fade to a pale simplicity compared to a rose bush, an earthworm would be a beacon, a dog would be a city of light, and human beings would stand out like blazing suns of complexity, flashing bursts of meaning to each other through the dull night of the physical world between. We would hurt each other's eyes. Look at the haloed heads of your rare and complex companions. In the future, we hope the Mentally Literate organisation, whether it be a club, a school, a university or a business, will be seen in the context of an extended family, guided by the same principles, understandings and visions. We have already, in the early 1990s, begun to see the first dramatic signs. The Brain Club, an international charity for anyone who wishes to learn how to use their brain, has established 'cells' in eight different countries, and publishes a magazine called Synapsia, the international Brain Club Journal. Meanwhile, students at Durham University, led by James Lee, have formed a club devoted to the promotion of Mental Literacy, and established a network throughout the entire English university system. 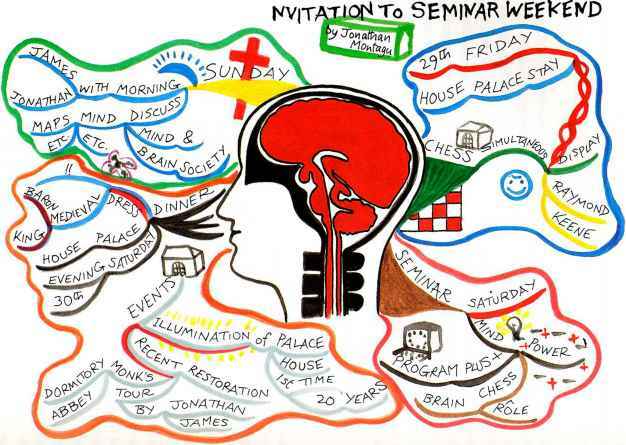 Mind Map by Jonathan Montagu of Eton College, outlining seminar weekend (seepage 289). Megatrends 2000, summarised ten trends for the human race as it approaches the millennium by identifying the metatrend underlying all the megatrends: 'Learning how to learn is what it's all about'. With increasing numbers of Mentally Literate individuals, families and organisations, we will soon see the dawning of Mentally Literate societies. This initiative has already had considerable effect. Apart from encouraging further research and exploration into the brain, companies such as EDS have initiated 'Education Outreach' programmes promoting Mental Literacy. We have also seen the launch of the Education 2000 programme, searching for new ways of understanding the brain's ability to learn, establishing life-long learning programmes throughout the country, and researching the future needs of schools. In addition an intellectual climate has been created in which the brain increasingly features on radio and television programmes and in the general media. Societies are considering both the general impetus of the 'Decade of the Brain', as well as such specific initiatives as that of the Venezuelans in creating a 'Minister for the Development of Human Intelligence'. 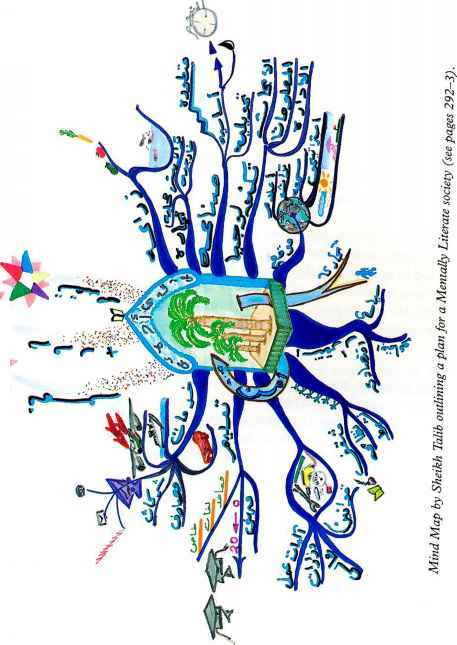 The Mind Map on page 291, done by Sheikh Talib the Arabian philosopher and thinker, outlines a plan for the development of a Mentally Literate society. Demonstrating its pan-linguistic nature, the Mind Map covers the stabilising roots of education, economy and politics, and includes the other major factors of agriculture, services, operating mechanisms, industry, communication and marketing. One of the interesting things about this particular Mind Map is that, during the early stages, a young waitress took a quick look at it, and when asked what she thought she saw, replied: 'It's a picture about making a better world.' She did not read the Arabic language, nor did she know beforehand what the subject was. This is a clear and vivid example of the success of the Mind Map as a basic communication tool, and of the importance of the application of research on how a human brain works. Tn the true racial experience the system of radiation which embraces the whole planet, and includes the million million brains of the race, becomes the physical basis of a racial self. The individual discovers himself to be embodied in all the bodies of the race. He savours in a single intuition all bodily contacts, including the mutual embraces of all lovers. Through the myriad feet of all men and women he enfolds his world in a single grasp. He sees with all eyes, and comprehends in a single vision all visual fields. Thus he perceives at once and as a continuous, variegated sphere, the whole surface of the planet. But not only so. He now stands above the group-minds as they above the individuals. He watches them as one might study the living cells of his own brain; but also with the aloof interest of one observing an ant hill; and yet again as one enthralled by the strange and diverse ways of his fellow-men; yet chiefly as the artist who has no thought but for his vision and its embodiment. Is it possible for us to even begin to approach such a Mentally Literate future? The Mind Map Book suggests that it is. What is a radiant thinker?